Have just returned from 3 months touring the Kimberley area and had a fantastic time. Did Karijini, Duncan Road, Bungles, Gibb, Mitchell Falls, Kalumburu and further and then Dampier Peninsula almost up to Cape Leveque with the van. Some really bad roads off the Gibb which itself was in good condition. I think we couldn't have been far behind the grader! The van performed brilliantly - took it easy with tyres at 25 and the only problems were one broken drawer latch and the retaining screw coming out of the winding handle on the ensuite vent. Found the handle on the floor but of course the screw had to go down the drain hole! Pretty minor stuff in a 12,500 km trip over some of the worst roads I've been on. One tough caravan! 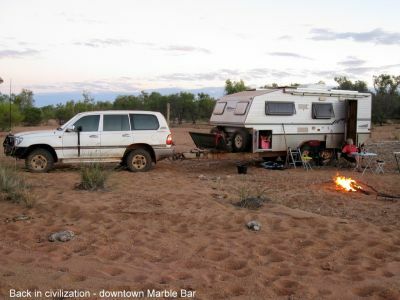 Going on long service leave in 2 years, family of 4 from the bush preparing for the 6 month trip around oz, not sure which way to go re van, camper, 4wdvan etc....? Our first move was a factory visit to Bushtracker, I suggest you start with that. Our next move is a scheduled September delivery 2010. The factory visit as recommended is an excellent start. Certainly your vehicle wont be an issue. We tow with a well equipped 2000 model 100 Series LC and it has never missed a beat and we have been on the long paddock full time for five years. A Bushtracker will take you where you want to go - just learn how to set it up properly get the right tyre pressures for the conditions and away you go. We have just done a section of the Gunbarrel Highway from Carnegie Station to the Heather Highway near Warburton in the Gibson Desert of WA. This track has not been graded since 1986, our Bt handled it well with no damage. This trip made the Gibb River Road look like a Sunday afternoon drive. More importanly at the end of the day when you opened the van door - everything was exactly as you had left it in the morning and NO DUST!